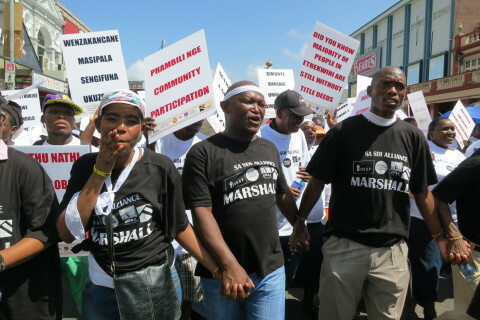 These messages pointed to the purpose of the march: to hand over an agreement of co-operation to eThekwini Municipality which outlined a more inclusive, implementable and participatory partnership between the municipality and organized groups of shack dwellers affiliated to FEDUP and ISN. The date of the march coincided with national celebrations around Human Rights Day. Most shack dwellers in eThekwini municipality and the country, however, do not benefit tangibly from the achievement of human rights in South Africa. 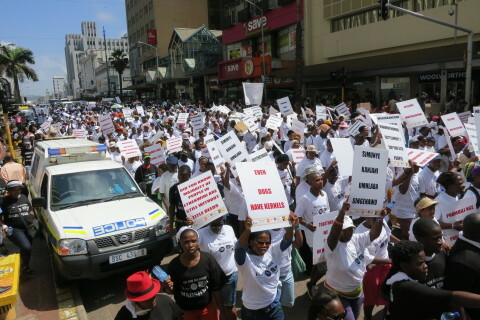 Land acquisition, housing, water and sanitation, refuse removal, access to electricity and informal settlement upgrading are urgent and daily recurring concerns. For shack dwellers in eThekwini municipality these issues are particularly expressed in the lack of a meaningful engagement between themselves and the municipality. 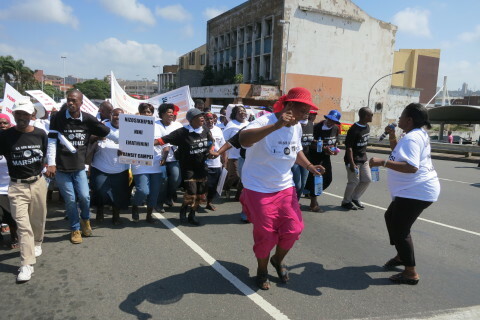 The march, therefore, aimed to set the scene for an inclusive and participatory working relationship. “Amandla, Imali Nolwazi, eish! Ayilumi Mayihlafuna” – Power is Money and Knowledge! Eish! You can’t bite while you are chewing! 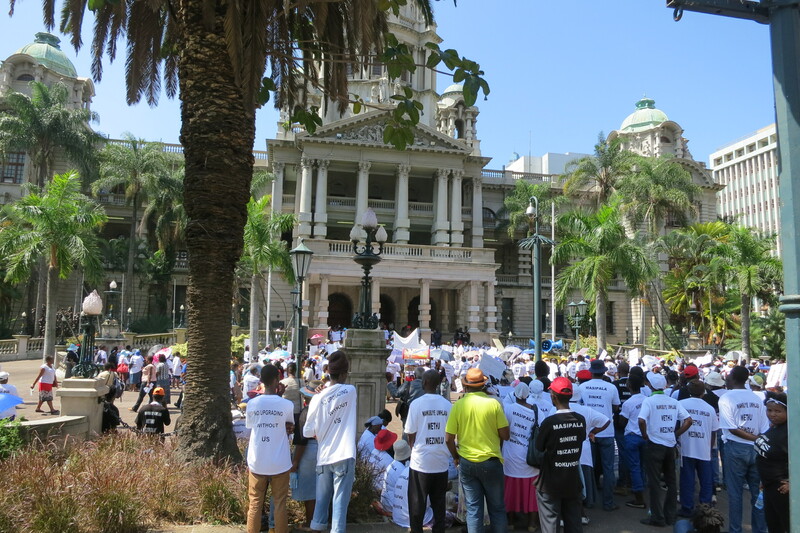 After 2km, the marchers, representing numerous informal settlement communities in eThekwini gathered in front of the City Hall to hand over the Agreement of Co-operation. The co-operation agreement outlined these concerns in more detail. 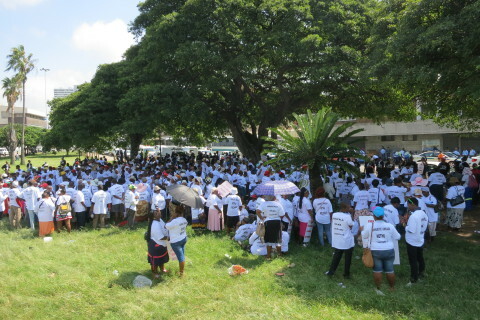 They relate to: a lack of updated facts and figures concerning the urban poor, a slow approach to land acquisition and assembly for informal settlements, inadequate delivery of basic services and disaster management, inadequate inclusion of the urban poor in municipal budgeting and planning processes, lack of municipal commitment to Joint Working Group structures to deal with uTshani Fund old debt and Pledge Housing implementation, limited social development, poverty alleviation, livelihood generation and nutritional programs as well as inadequate access to finance in funding community based upgrading projects. The agreement of co-operation also outlines the purpose and joint activities for future collaboration, emphasizing practical and implementable suggestions. Several provincial alliance members shared their experiences around lobbying and mobilization with the marchers. Joe Nene, advisor to the Mayor, then joined national coordinators Rose Molokoane (FEDUP), Mzwanele Zulu and Patrick Magebhula (ISN) as the agreement was read out and handed over. Mr. Nene received the agreement, emphasizing that he could not promise a signature but that it would be passed on to the mayoral office, which would respond within seven days. 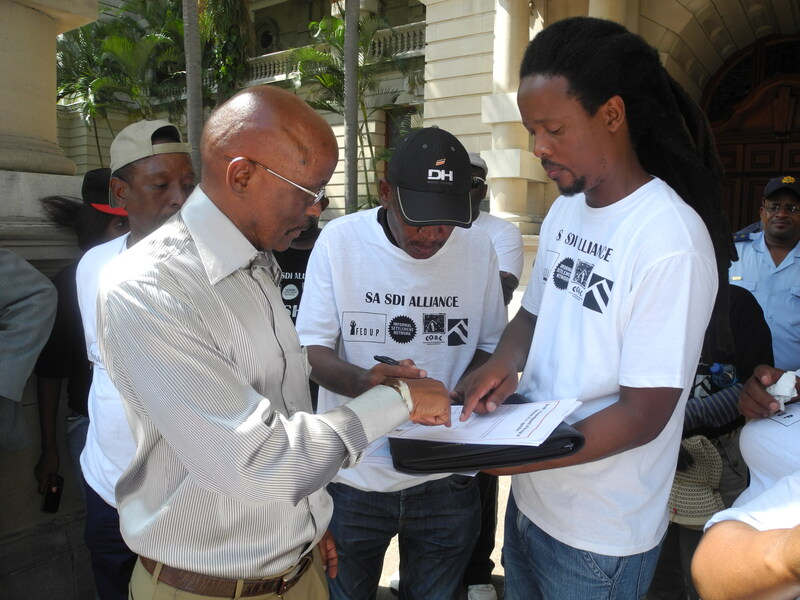 “We want to plan together with the municipality so that they know our priorities. They need to talk to us. There’s nothing for us without us. We want to know that we have agreed together”.